Our Online Survey Manager enables you to create and manage surveys that can be distributed via eCards, your website, blog, social media or email program. 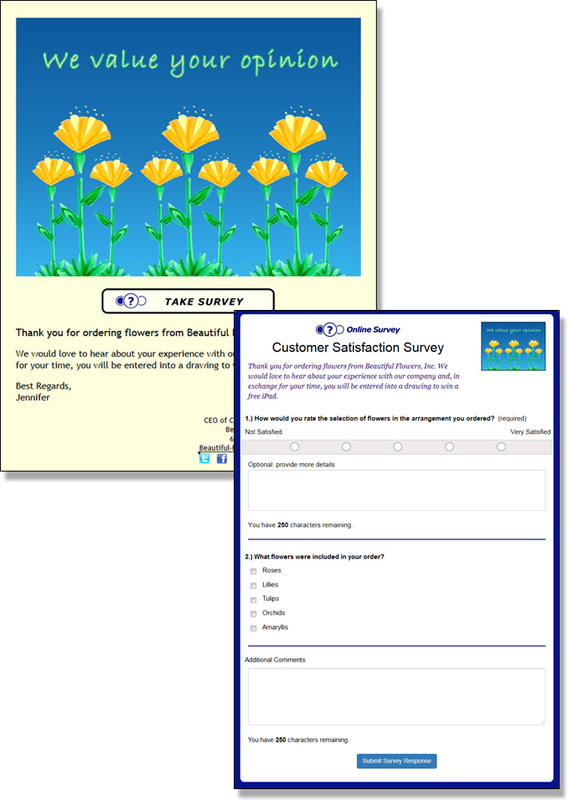 Your recipients can respond from an eCard or a direct link to the survey response form. The Survey Manager automatically records responses in real-time. You can view and print a detailed report of survey responses on an individual or aggregate basis in a variety of formats as well as easily send follow-up messages. You can create an unlimited number of surveys and each survey can have up to 20 questions with answer choices ranging from single, multi-select, a rating scale or an open text answer (comment box). This tutorial contains a general overview of how the survey manager works. Click on the links in the tutorial to see more detailed information on a particular section. You can combine a single, multi-select or rating answer with an open text answer. Create an eCard using any of our designs or your own and select the survey you want to include as part of the eCard. No matter how many eCards you send with a link to the survey response form, a consolidated 'Recipient List' will automatically be created for you so you can easily follow up with people who did not respond to the survey. Alternatively, you can link directly to the survey response form from your own email program, website, blog, or social media using our 'Direct' Link feature. View, print and export responses in a variety of formats. Easily send follow-up messages like reminders, follow-up surveys and more. The Survey Manager allows you to create and manage multiple surveys at the same time. An unlimited number of surveys can be managed from your account each month. This is all included in your monthly subscription.